• Overall Size: 38H" x 18W" x 18D"
Ready to add the last unit to your showroom display to finish off that custom built-in look you want for your retail store? 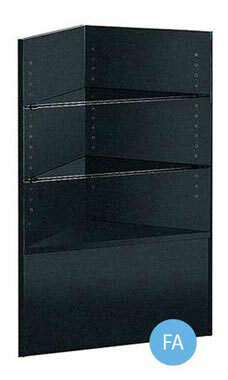 It's easy to do with the Black 90 Degree Corner Filler Display from Store Supply Warehouse. Featuring two adjustable tempered glass display shelves, these corner display units will help tie two display units together while putting space to work, providing retailers with extra shelving for additional displays. The black low pressure melamine laminate finish will match almost any display fixture within your store, especially our black display units. Overall size measures 38"H x 18"D x 18"L. Shipped in crating for secure shipping. Fully assembled and ready to ship.